This entry was posted in Mental Health, Recovery & Support and tagged Preventing Misuse, Support, Treatment on September 9, 2016 by Team Addiction Hope. The main aim of National Recovery Month, according to SAMHSA and other organizations, is to promote awareness and knowledge of how people have overcome their addictions or mental issues. Celebrating the accomplishments of these brave people is just as important as acknowledging those who have overcome other serious health problems. 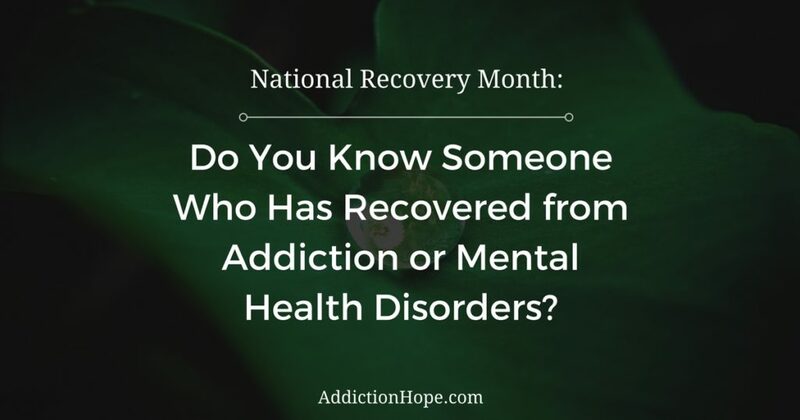 By honoring the spirit of the people who attain a healthy life after suffering from a mental or substance abuse problems, National Recovery Month hopes to encourage current sufferers of such problems to try and overcome these obstacles. Promoters want everyone to know it is just as possible for people with these issues to live a healthy life as it is for everyone else. National Recovery Month is now in its 27th year of observance. Each year, it strives toward its main goal by collecting and sharing the stories of individuals who have overcome their mental disorders or substance abuse problems. The people who work to make such recoveries possible are also celebrated this month – namely, the ones who offer prevention, treatment and recovery assistance to struggling people. This September’s theme acknowledges the support families give to those suffering from substance abuse or mental disorders. Family members play several vital roles in helping their loved ones who have a substance abuse or mental issue. The most obvious of these is simply lending support and encouragement. However, the most critical action taken by the family may be the recognition of a problem. Those suffering from a mental disorder or a substance abuse problem may not always realize it, or they may be in a state of denial. Family members are in a unique position to see the symptoms of these issues and convince the affected person to seek the treatment he or she needs. Promoting the knowledge that recovery is possible is incredibly important because it gives hope to the millions of people who suffer from these afflictions. SAMHSA’s statistics report that more than 40 million adults experienced a mental disorder in the last year. Also, more than 20 million people older than 12 years old had substance abuse problems. This means there are tens of millions of people who need to know they can overcome the challenges facing them. SAMHSA has found that, for many sufferers, the journey to regaining full health begins with hope, as introduced by family, friends, colleagues and many other people in the individual’s life. This September, remember those people who have worked to overcome great odds and take back their lives from a mental disorder or substance abuse problem.